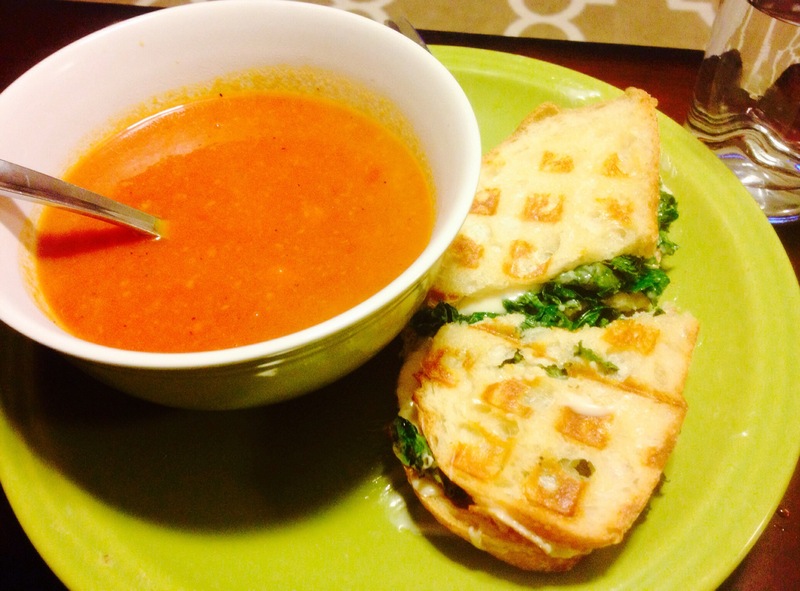 Comfort Food: Grilled Cheese & Tomato Soup – .rebel grrrl living. Thank you all for the kind wishes about my grandmother’s passing. We had a lovely celebration of her life last weekend, and I am inspired to live in a way that honors her memory. There were a few recurring themes through the afternoon. Almost everyone talked about her smile, her utter joy for life, and the selfless way she loved and cared for others. Something that struck me even more was when one person noted how, “She really liked and cared for herself and that gave her the energy and ability to love and care for others.” What an important lesson for so many of us who are caught up in judging ourselves (our bodies, our work failures, our relationship mistakes, etc. etc.). I’m going to try really hard to practice that as a means of carrying on Ammie’s legacy, and in order to be a better caregiver to myself and others. A week after her death, I was lucky enough to get a visit from Logan, a dear, out-of-town friend. He cooked us a comfort food dinner one night which included vegan grilled cheese and tomato soup. 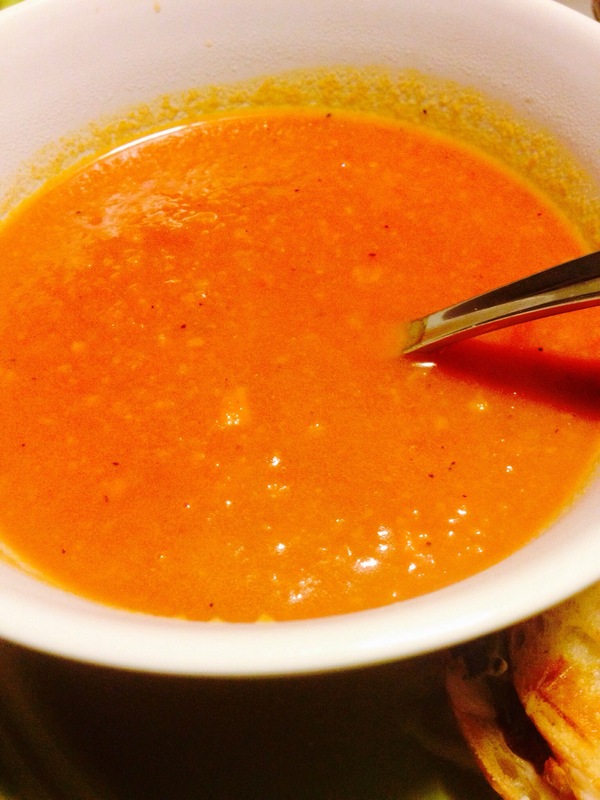 The soup was unbelievably delicious and I requested the recipe so I could blog it for you all. Fortunately, he was happy to oblige! 1. Heat oil in a pot, enough to cover the bottom of the pan. When the oil is ready, toss in onion and carrot. Saute for 3-5 min until veggies start to soften. 2. Add salt, pepper, garlic, tomato paste, and cayenne if using. Also add 1/2 Tbsp sugar. Stir to coat veggies with paste+spices. Let simmer for another minute or two. Paste should darken but not burn… turn down the heat if it’s browning too fast. It should start to smell sweet when it’s ready. 3. Add diced tomatoes, including liquid. Stir everything up well. Let simmer 10-15 minutes, stirring occasionally. You want the tomatoes to start to break down. 4. Add broth and bring to a boil, uncovered. Then reduce heat to simmer for another 10-15 min. 5. Remove from heat and puree! (I don’t usually puree all the way.) Taste and adjust for seasoning. Add remaining 1/2 Tbsp sugar. Add balsamic, stir well, and let warm for 5+ min to allow flavors to mix etc. If you prefer thicker soup, either use less broth or let simmer longer. I prefer the latter because it lets the soup’s flavors get stronger. If making in a crockpot (ie in morning and having fresh soup to come home to), just toss everything but the balsamic in and cook on low. When you get home, puree, taste and adjust spices/sugar, and then add balsamic. This soup is perfect for the colder weather. Enjoy! How nice to have a friend take care of you! It’s hard to think of ourselves sometimes. The soup sounds fantastic.I love most soups, miso might qualify as one of my favorite comfort foods… but also bagels with tofu cream cheese…does that count? Aww sweetie, I am behind in blog reading. I am so sorry to hear about your grandmother’s passing. It’s so lovely when a funeral can be a celebration of life rather that just being sad about death. I popped over to that post and she sounds like such an amazing woman. Sending you lots of love! It *was* like a warm hug! I’m so sorry about you grandmother. It sounds as though she was an absolutely jubilant woman. Thank you, Dayna. Jubilant is an excellent word to describe her! Pingback: Best Vegan & Gluten-Free Pizza Crust | .rebel grrrl living.